The Tunturi J3.5F treadmill is Tunturi’s cheapest treadmill in the market today. This unit’s biggest advantage over other machines in the $1,400 price range is its quiet motor. This treadmill was manufactured for general fitness improvement. So, it would fit people who like to jog or run. But, this is just an ordinary mid-priced treadmill. I don't see anything special about it. The J3.5F treadmill offers a 2.0 HP continuous duty motor which is pretty decent considering its price tag. This motor has enough power to sustain speeds of up to 10 miles per hour. Plus, it can be inclined for up to 10% which is perfect for those who loves intense workout. The 5 training profiles give you more variety and flexibility in your runs. Each profile can be edited to fit your needs more. Or, if you want, you can also use the manual training mode and simply adjust your exercise intensity by hand. The 17” x 51.5” running area is a little small compared to other mid-priced models. So try running on it first and be certain that you're comfortable on it before deciding to buy. The 5 window display shows you your time, distance, speed, energy consumption and heart rate so you’ll always know all the information that are important to you. This treadmill's biggest weakness is its quality. Tunturi should put better quality parts on this machine if they really want to compete with best buy treadmills in this price range. I wouldn’t recommend the Tunturi J3.5F treadmill. It belongs in the very competitive mid-priced range category, and in this category, you'll be better off buying a Smooth 7.1HR or a Sole F80. 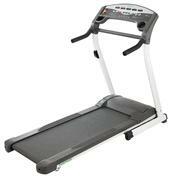 They are our best buy treadmills below $1,500. If you still plan on buying a Tunturi J3.5F treadmill, I suggest you buy it at Amazon. They offer the cheapest price around the net. You can get it for just $1,399.99.